It is a story that has grown into Lahainaluna High School legend. 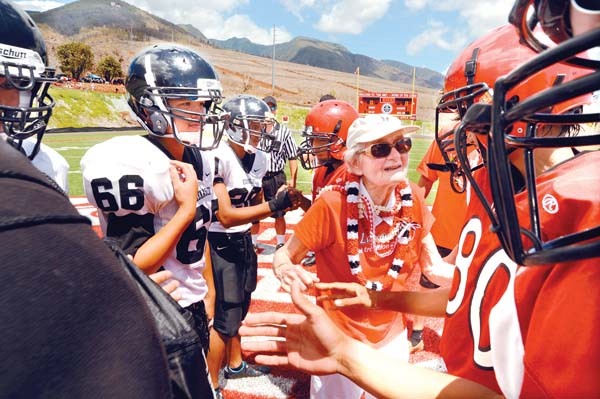 Longtime West Maui resident Sue Cooley attends a Lunas football game in which they made a large comeback before coming up short. After the game, standing outside the locker rooms at War Memorial Stadium, Cooley hears the football boys — “my boys,” as she would later call them endearingly — sing the school’s Hawaiian-language alma mater. That was more than a decade ago, and while some of the details are lost in the minds of Luna Nation faithful, they will never forget the generosity of Cooley, who died in February at 93. There will be a celebration of life in the on-campus stadium that bears her name on Saturday from 8 to 10 a.m.
“By then, (Cooley) was already in her 80s, but she really knew football,” longtime friend Betty Sakamoto said Monday. “It was a game (the Lunas) were losing, they were at zero and the other team was in the 30s at halftime. Then all of a sudden, (the Lunas) really fight so hard to win that game, but they lost. Cooley made that first contribution of $1 million soon after. It was the first of seven donations to the Lahainaluna High School Foundation that totaled $7.5 million for the Sue D. Cooley Stadium facility, built for a total of $9 million, that now stands on the 186-year-old campus. Sakamoto presented Cooley a state championship ring — from the 2016 Division II title that the Lunas won in November — just hours before she died on Feb. 18 in Seattle. LHS Foundation president Mark Tillman recalled the tribute to Cooley that ESPN anchor Neil Everett put together on a “SportsCenter” broadcast following her death. During Cooley’s visits to Lunas practices, players would show their appreciation. Tihada said the facility has cut down on player injuries — the team used to practice on a hard-scrabble dirt field that was pocked with holes. Well-wishers are asked to wear red to Saturday’s ceremony, which will be casual dress. Flowers will be appreciated. A silent auction of Cooley’s artwork will be held Friday from 5:30 to 8:30 p.m. at Village Galleries in Lahaina — the proceeds will go to Hale Makua and the LHS Foundation.